« What is Single Pass Parallel Processing (SP3) Architecture? Palo Alto takes a good approach in designing the architecture for their next generation firewalls. Palo Alto offers processors dedicated to security function that work in parallel. Palo Alto firewall contains separate Control Plane and Data Plane. By separating them Palo Alto is ensuring that each plane runs independently and they do have dedicated processors, memory and hard drives. 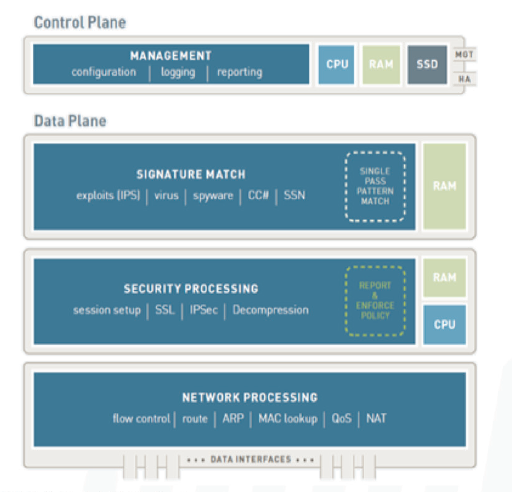 Some of the high end firewall comes with 2 to 6 core CPU dedicated either in Data Plane or Control Plane. You can read the product specifications for more details. Security Matching Processor: Performs vulnerability and virus detection. Network Processor: Performs routing, NAT, QOS, route lookup, MAC Lookup and network layer communications.